Since the 2016 election, the watchword has been "fake news". While all news isn't "fake", there is a great deal of media bias that provides readers or listeners with a narrative that is far from unbiased. Such was the case in a recent New York Times article as you will see in this posting. There is total chaos in Venezuela. Hunger, lack of medicine and latest, nearly the whole country had a blackout." Later in the video she discusses Venezuela's hyperinflation, how its lack of access to medicine has reduced Venezuelans' life expectancy by 3.6 years (an interesting calculation) and how the nation suffers from a Syria-like refugee crisis. She goes on to note that the Trump Administration is considering options including military intervention and goes on to note that the political left in America, including a number of celebrities and other influential Americans, are pushing back, trying to prevent the inevitable nation rebuilding interference in Venezuela that has become the narrative in Washington for the past three administrations. She shows a video clip where Bernie Sanders is confronted by Wolf Blitzer about his unwillingness to call Maduro a dictator as well as a brief clip showing Maduro telling Donald Trump to keep "hands off Venezuela immediately". She continues to philosophize about Donald Trump's affinity for dictators but notes that Venezuela suffers at the hands of a tyrannical dictator. She notes that the anti-Trump interference movement of America's left is dangerous because the are glorifying a "brutal dictator" and "promoting inaction" and that these two factors are the worst combination for ordinary Venezuelans. 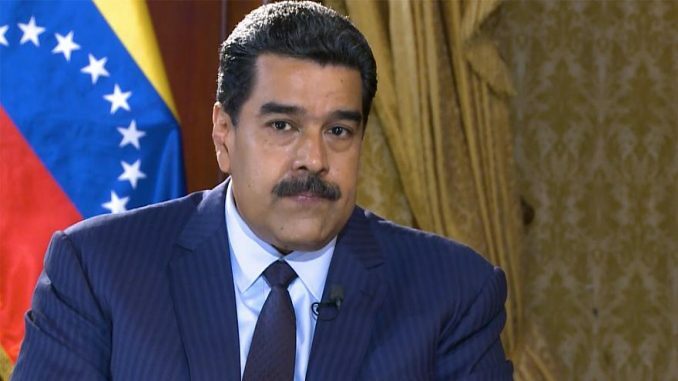 She concludes that the key to the problem is for the United States to support Venezuela's efforts to restore its democracy and that 50 nations and the United States have recognized Juan Guiado as the new interim president. She states that Guaido is not an American right wing puppet leading an illegitimate coup but a social democrat appointed by the National Assembly, the only remaining democratically elected institution left in Venezuela. According to her, his job is to ensure free and fair elections. It's wonderful that she is proud of her father, isn't it? That, however, is not the point. "In a day when most families balance two careers, the legitimate activities of companions, spouses and other relatives can sometimes create journalistic conflicts of interest or the appearance of conflicts. They can crop up in civic or political life, professional pursuits and financial activity. A spouse or companion who runs for public office would obviously create the appearance of conflict for a political reporter or an editor involved in election coverage. A brother or a daughter in a high-profile job on Wall Street might produce the appearance of conflict for a business reporter or editor. "Staff members must be sensitive to these possibilities. Any staff member who sees a potential for conflict or a threat to the paper’s reputation in the activities of spouse, friends or relatives must discuss the situation with his or her supervising editor and the standards editor or the deputy editorial page editor. In some cases, disclosure is enough. But if The Times considers the problem serious, the staff member may have to withdraw from certain coverage. Sometimes an assignment may have to be modified or a beat changed. In a few instances, a staff member may have to move to a different department — from business and financial news, say, to the culture desk — to avoid the appearance of conflict." 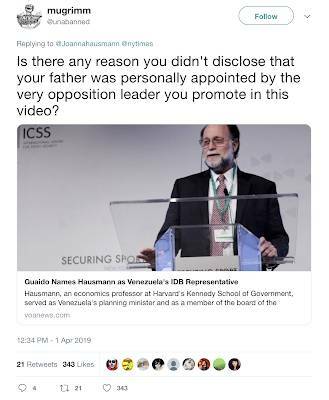 We have no idea whether Ms. Hausmann reported the conflict between her op-ed video and her father's appointment by the man that she is clearly promoting as the new leader of Venezuela. 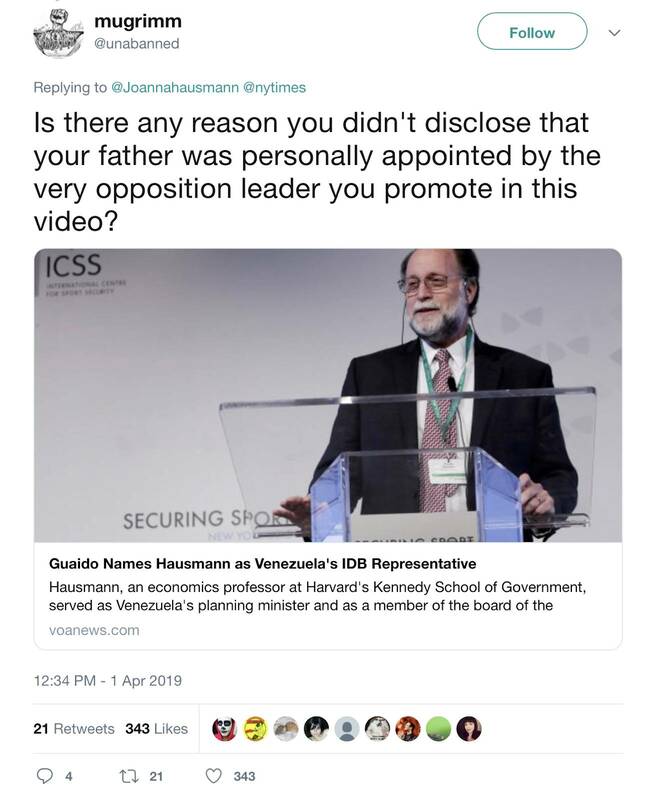 Nonetheless, it would appear, at the very least, that the New York Times was remiss in allowing her to post a piece of any type that was linked to her father since it is a direct violation of the "Sorting Out Family Ties" section of its editorial policy. This should be of concern to all of us. While everyone is aware of the existence of fake news, we are less aware of how editorial conflicts of interest can be used to sway public opinion, particularly in the case of a highly influential and widely read newspaper like the New York Times. It is bias of this type that can lead both readers and voters into believing that Washington should declare war on Venezuela because an "undeclared insider" whose family stands to benefit from military action against the existing government says so.